With Doug Dillard, Rodney Dillard and John Hartford. Samm Bennett, Greg Selker, Linda Dillard, Ginger Blake and Laura Creamer. 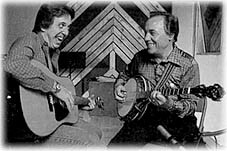 Rodney Dillard, Dean Webb and Earl Scruggs teamed up together for an extended tour. Doug Dillard went to Malta to appear in Robert Altman's movie "Popeye", which starred Robin Williams and had songs by Harry Nilsson. Doug had a speaking part this time, as the character "Farmer Clem". Released on Boardwalk records (SWAL 36880). 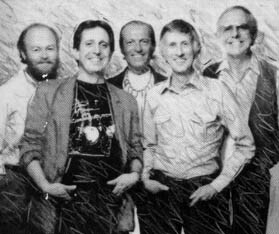 The basic tracks were recorded on location in Malta by "The Falcons" (Ray Cooper, Doug Dillard, Harry Nilsson, Van Dyke Parks, Klaus Voormann, and The Mysterious Karsten). Harry wrote all of the songs except for "I'm Popeye the Sailor Man". 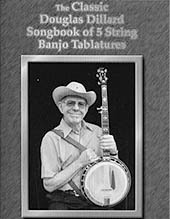 Also this year Doug and Jack Hoffmann collaborated together to produce a textbook, "The Bluegrass Banjo Style Of Douglas Flint Dillard". The book includes the fundamental instructions for bluegrass banjo pickers, left hand techniques and the sheet music for many of the Dillards' most popular tunes. Rodney settled down in Branson. 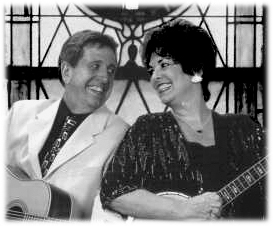 For the next six years Rodney, his new wife Beverly and Dean Webb performed together at the "Silver Dollar City" amphitheater. Rodney kept the Dillards with various members alive. Doug Dillard reformed the Doug Dillard Band in 1983 with various members over the years. 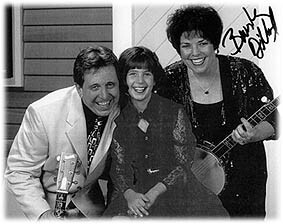 Only Ginger Boatwright was a permanent member of the band. Other members were Kathy Chiavola, Billy Constable, Roger Rasnake and David Grier. Other songs done by "The Burrito Brothers" (with Gib Guilbeau and John Beland), Ricky Skaggs and Lacy J. Dalton and two instrumentals. Also 1983 Rodney was in a group named "Dillard, Hoppers & Friends". 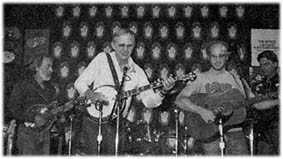 Lonnie Hoppers is a fine banjo player from Missouri who once played with Bill Monroe! With Rodney Dillard, Dean Webb, Steve Cooley, Rick McEwen and Ric Williams. Guests: Beverly Cotten Dillard, Annette Carlton, Greg Allen, D.A. Callaway and Charles Cochran. Guests: D.A. Callaway, Annette Calton, Fred Carpenter and Beverly Cotten Dillard. Produced by Rodney Dillard and Bob Millsap. In 1986 Doug released his next album for Flying Fish, "What's That?". The group still included Ginger, but also included Roger Rasnake and David Grier. With Doug Dillard, Roger Rasnake, Ginger Boatwright and David Grier. Guests: Bobby Clark, Vassar Clemments, Rodney Dillard, Pat Flynn, David Grisman, Mark Howard, Joe Osborne, John Probst, Buddy Spicher and Gordon Stinson. Produced by Doug Dillard and Rodney Dillard. Produced by Bob Millsap and Rodney Dillard. With Doug Dillard, Roger Rasnake, Ginger Boatwright, David Gried and Jonathan Yudkin. The album garnered a Grammy nonination in the bluegrass category! Note: Both albums ("What's That?" and "Heartbreak Hotel") were released on one CD in 1993 by Flying Fish Records (FF70477). In May 1988 the original line-up with actor Denver Pyle, who played "Briscoe Darling" in "The Andy Griffith Show" got back together on TNN's "Nashville Now". The Original Dillards reunited for the "Andy Griffith Show" special, a made-for-television movie: "Return To Mayberry"! This was an amazing undertaking. Twenty years had passed since the Dilllards made their final appearance on the show as The Darling Boys, The film received the season's highest rating for a made-for-TV movie and at the time became the seventh highest-rated made-for-TV movie of all time. With Doug Dillard, Rodney Dillard, Dean Webb, Mitch Jayne and Steve Cooley. Guests: Beverly Cotton Dillard, Homer Dilllard, Ginger Boatwright and the people of Salem. Produced and directed by John McEuen. Written by John McEuen, Rodney Dillard and Mitch Jayne. The thirtieth anniversary of "The Andy Griffith Show" provided another infusion of interest in the Dillards plus Steve Cooley. 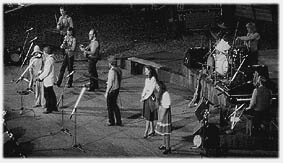 Originally the group had agreed to play four concerts. The number of concert dates grew to eight, then twelve and upward, until finally the Dillards played one hundred and thirty-two dates, including performances in Great Britain and Japan. With Rodney Dillard, Dean Webb, Mitch Jayne and Steve Cooley. Guests: Herb Pedersen, Byron Berline, Bill Bryson, Ric Williams, Scott MacPherson, Tom Brumley and Bob Warford. 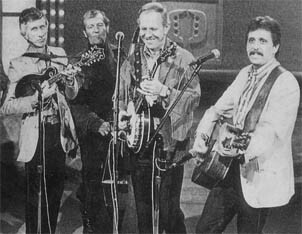 The song "Darlin Boys" garnered the band a Grammy nomination! After the recordings for that album Herb Pedersen went back to the "Desert Rose Band". With Rodney Dillard, Steve Cooley, Rick McEwen and Ric Williams. Guests: Gary Smith, Fred Carpenter, Dave Milligan, Mitch Kiersey and Beverly Cotton Dillard. The same year Rodney became Vice President of Creative Productions and serves as Production Executive for a subsidary Patch Entertainment. With Rodney Dillard, Dean Webb, Steve Cooley and Mitch Jayne. Guests: Gary Smith, Mark Pearman, Jeff Jarvis, Jeff Donachy, Darren Novotny, Benny Wood and Suzan Tilbury. Produced by Rodney Dillard and Steve Cooley. Rodney and wife Beverly Dillard (as "The Ozarks") perform the song "Rolling Stone" on the soundtrack for the mini-series "The Wild West" produced by John McEuen. Beverly Dillard performs another song "Cluck Old Hen". Patch Entertainment acquired Caravell Studio in Branson, where Rodney's duties include production coordinator, studio manager and studio overseer for Patch, along with working in artist development. Here are pictures from the Original Dillards when they played in Guthrie, Oklahoma in Oct. 1998. Picture right is with John Hartford and Barry Patton (Byron Berline's nephew) playing bones. 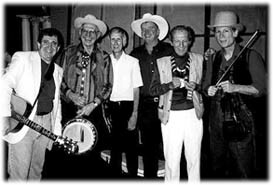 The Original Dillards performed also together with Byron Berline at the 2nd Oklahoma International Bluegrass Festival in October 1998. Picture left again the Original Dillards in August 1999 with Carsten Panduro of "Tonder Festival" in Denmark. Tim Crouch, Danny Yancy, Jarrett Dougherty. Produced by Rodney Dillard and Bruce Haynes. With Beverly Cotten-Dillard, Rodney Dillard, Doug Dillard, Dean Webb and others. Long-awaited songbook by Doug Dillard contains exact transcriptions in banjo tablature that capture the unique playing style of Douglas Dillard. This fantastic collection includes all of his best-loved tunes, from the Andy Griffith Show, from his many great years of recording as the original Dillards, and from his solo banjo albums and his releases with The Doug Dillard Band. Features more than 20 tunes in G tuning, C tuning amd G modal tuning, including classics such as: Cripple Creek � Hickory Hollow � Jamboree � John Henry � Old Joe Clark � Buckin' Mule � and more. 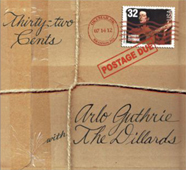 The Dillards performed with Arlo Guthrie and Pete Seeger at the Carnegie Hall on Nov. 30th 2002. Guthrie plans to release an album of timeless songs by Woody Guthrie with special guests The Dillards. This album was released 2008 on Rising Son Records with the title "32 Cents" (more info later - 2008 section). Millstream Records released a double CD-sampler with one track from that album "Do-Re-Mi". Rodney Dillard sings the Dillards song "There is a time" (written by Rodney Dillard and Mitch Jayne) on the Nitty Gritty Dirt Band album "Will the circle be unbroken - Part 3". The Dillards recorded that song 1964 for their album "Live!!! Almost!!!. July 2003 Beatball Records released the Dillards "Decade Waltz" album from 1979 on CD with great booklet and complete album discography (band and solo)! Rodney Dillard produced an album 2003 for Albert E. Brumley, Jr. with the title "I'll fly away". Musicians on that album are: Tim Crouch, Boone Carlon, Steve Bush, Randall George, Dean Holman, Bruce Haynes & Jimmy Ponder. This CD was released by "Copper Creek" records. 2004 Rodney Dillard released a self-produced solo CD with the title "I Wish Life Was Like Mayberry". This recent release is taylor-made for Mayberry fans. That's 8 outstanding tracks of Mayberry and Mayberry-esque music, plus a final track with Rodney's personal reflections about what it means to have a Mayberry life. Also a must for Dillard fans. The album was recorded in Branson, MO and has Rodney's son Brian Dillard on harmony vocals. Rondal George, Rick McEwen and Rodney's son Brian Dillard. 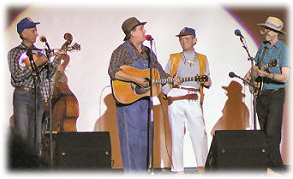 Summer 2004 Doug & Rodney Dillard performed together at several events from California to Kentucky to North Carolina and beyond. 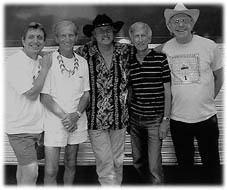 Note: Dillards founding member Dean Webb has recorded a new CD with his group "MISSOURI BOAT RIDE". Songs recorded on that album are: Man of constant sorrow, Old home place, Old train, Old and in the way, How mountain girls can love, Back to the old home etc ... . Note: 2004 "Elektra Records" has released a double CD including three Dillards albums and two singles: "Pickin' and fiddlin'" with Byron Berline, "Wheatstraw suite" and "Copperfields" and 2 singles as bonus tracks which were recorded for "Capitol Records" in 1965. Note: May 2005 a Dillards compilation CD with 29 tracks from 1963-1979 was released: "The Dillards: Let the music flow - The best of 1963-79" (RVCD197). 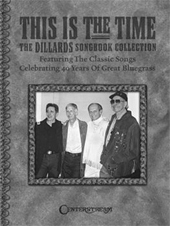 Spring 2005 "Centerstream Publishing" released a Dillards songbook "THIS IS THE TIME - The Dillards Songbook Collection". Featuring the classic songs, celebrating 40 years of great Bluegrass. Book includes a foreword by Mitch Jayne and Rodney Dillard, a discography of The Dillards and 26 songs like "Dooley", "Old home place", "There is a time", "Ebo Walker" and many others! Steve Bush, Lee Hendrix, George Giddens and Greg Roller. 2005 Rodney released a CD with old material (from the early 60s) under the title "The Dillards - Doug and Rodney: The lost years". Another new released CD with Rodney Dillard (no music!!!!) is the Mayberry Moments - Volume 1. Rodney takes a look back at episodes of the "Andy Griffith Show" and the great moral and life lessons they taught. From the archives of the popular radio show, hosted by Rodney Dillard, "Mayberry Minute" which ran nationally for 3 years. 2007 Mitch Jayne wrote a new book. His latest novel, "Fiddler's Ghost" is available from www.wildstonemedia.com and www.amazon.com. 1) "The Forest in the Wind" published 1966 by The Bobbs-Merrill Company. This book is out of print. 2) "Old Fish Hawk" published 1970 by J. B. Lippincott Co. The cover painting is by Mitch himself. This book is out of print. 3) "An Up To Date Biography of the Original Dillards" self-published by Mitch Jayne in 1989. Rare book contains some of Mitch's humor columns from two Missouri newspapers: the Salem Sun and The Shannon County Current Wave. Mitch still writes a humor column for The Current Wave, which is published in Eminence, Missouri, where Mitch lives with his artist wife, Diana. This book also contains illustrations by Mitch. 4) "Some More Home Grown Stories & Home Fried Lies" self-published by Mitch Jayne in 1994. Rare book collects Mitch's humor columns from The Current Wave, with illustrations by Diana Engstrom, who later became Mitch's wife. 5) "Home Grown Stories & Home Fried Lies" published 2000 by Wildstone Media. Cover illustration and inside illustrations are by Mitch's wife, Diana. This book is available at www.wildstonemedia.com and www.amazon.com. 6) "Fiddler's Ghost" published 2007 by Wildstone Media. Cover painting is by Mitch's wife, Diana. This book is available at www.wildstonemedia.com and www.amazon.com. 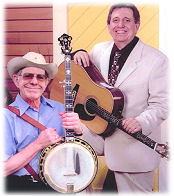 Doug and Rodney Dillard are continuing their American tour in 2008. Schedule and booking information can be found at www.the-dillards.com. Early 2000 Arlo Guthrie sat down with his old friends, The Original Dillards in Branson, MO and spent a few days recording some of his father's (Woody Guthrie) songs together. This record was originally planned for when the US Post Office released a Woody Guthrie stamp worth 32 Cents. Now it's released. February 2009 Dewey Martin who played drums for the Dillards 1965 and recorded two singles with the group for Capitol Records died at the age of 68 in his Van Nuys apartment. Dewey Martin was hired after a Dillards tour from Stephen Stills to form Buffalo Springfield. Martin was one of the founding members, along with Neil Young, Stephen Stills, singer-songwriter-guitarist Richie Furay and bassist Bruce Palmer. !!! 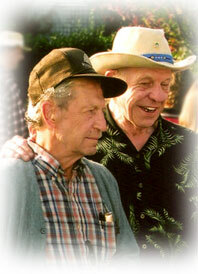 Original Dillards inducted into the International Bluegrass Music Hall of Fame !!! 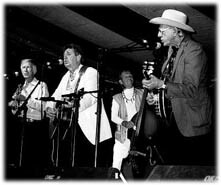 2009 "The original Dillards" - Doug & Rodney Dillard, Dean Webb & Mitch Jayne - were inducted into the "International Bluegrass Music Hall of Fame". 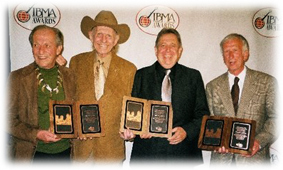 Visit the IBMA page and read about the awards show on Oct. 1st 2009. Rodney Dillard & The Dillard Band will incorporate a greater anthology of music at festivals and other special events (such as songs from when Herb Pedersen or Billy Ray Lathum were Dillards; songs from the "Wheatstraw Suite" album as an example). They will still be playing the bluegrass classics of course but are also excited about showcasing a wider range of Dillards history. Their hope is to feature Doug Dillard as a special guest at some dates throughout the year and they'll keep their fanbase updated on any developments. Overall the four original Dillards will continue pursuing separate careers, as can happen over the course of 50 years! Here's the first picture (right) of "Rodney Dillard & The Dillard Band". It's from left to right: Rodney Dillard: lead vocals/guitar- Shane Lail: bass/harmony - George Giddens: fiddle/mandolin/harmony - Patrick McDougal: banjo/harmony. 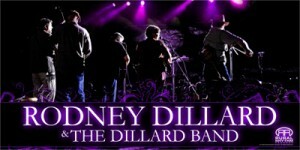 Rodney Dillard & The Dillard Band" will release a new CD in September 2010. The CD "I WISH LIFE WAS LIKE MAYBERRY" contains all the Darlings / Dillards classics performed here by RODNEY DILLARD & The Dillard Band including the first radio single release, "There Is A Time". "I wish life was ..."
In addition to all the classics, there are four new original songs written by RODNEY DILLARD and friends of Rodney including:� "There Goes The Neighborhood", "Wicker Rocking Chair", "The Mayberry Hat" and "The Andy Griffith Show". As a BONUS, the album will also contain five episodes from the popular radio show "Mayberry Minute"�� a show that ran nationally for 3 years and was narrated by RODNEY DILLARD. 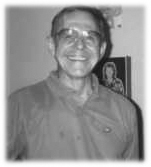 Mitch Jayne (July 4th 1928 - August 2nd 2010) died on monday, August 2nd 2010 of cancer - he was 82! Boone Carlin, Beverly Cotten Dillard & Brian Dillard. Steve Cooley (a member of the Dillards from the 80s and 90s) is working on a recording project to offer a tribute to some of the excellent Dillards material from all eras to help keep the torch lit and the tunes alive. Hopefully it will be complete mid 2011 and Steve hopes to get Herb Pedersen, Billy Ray Lathum and the other guys involved. Rodney Dillard & The Dillard Band feat. Beverly Dillard: Rural Rhythm Christian announces the August 16, 2011 album release, "Don't wait for the hearse to take you to church". The album features stand out tracks like the title cut, and also the "The Devil Just Can't Knock Me Off My Knees", written by the Dillard's friend and 5-time Dove Award winning songwriter Bruce Haynes. Musicians on the new CD include: Rodney Dillard (lead & harmony vocals, guitar, dobro), Beverly Dillard (lead & harmony vocals, banjo), Steve Bush (banjo, mandolin, bass), George Giddens (fiddle, mandolin, harmony vocals), Tim Crouch (fiddle, mandolin), Bruce Hoffman (fiddle), Marty Wilhite (bass), Pete Generous (percussion) and Jim Glaspy (harmony vocals). 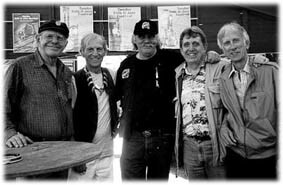 Tim Crouch, Bruce Hoffman, Marty Wilhite, Pete Generous & Jim Glaspy. DOUG DILLARD died on May 16, 2012 following a lengthy illness at the age of 75!! This is Dean Webb with his plates of the "International Bluegrass Music Association's HALL OF FAME" inductee October 1, 2009! Dean Webb is playing in a band called The Missouri Boatride Bluegrass Band. Note: Rodney Dillard offered Dean to join his "Dillard Band" when Rodney started it a few years ago. Dean didn't wanted it, because he's very happy playing in The Missouri Boatride Band! Note: Doug Bounsall - member of the Dillards in the late 70s - died in a car accident in 2012. 2013 Byron Berline & Jane Frost wrote a fantastic book about Byron Berline's career! A MUST HAVE for every Country Gazette, Flying Burrito Brothers, Dillards, Clarence White, Gram Parsons .... fan! Forty years of journal entries document the L.A. recording industry from the Rolling Stones to the Byrds, and Alvin and the Chipmunks. They include hilarious stories of being one of the most sought after session players on the west coast, by three time National Fiddle Champion, Byron Berline, a Flying Burrito Brother who founded Country Gazette, The L.A. Fiddle Band and Sundance. His avoidance and survival of the drug-filled music industry, is amazing and heart lifting. His stories of the road are hilarious and the detailed journal entries are a researchers dream. From earthquakes to scoring motion pictures and having some of Charles Manson's Family in his home, this autobiography is the account of an Oklahoma farm boy's life and career -- from entering the University of Oklahoma on a football scholarship and graduating with a javelin in one hand and a fiddle in the other. It continues through acting in movies and his time playing/recording with Bill Monroe, Mickey Mouse, Linda Ronstadt, Emmy Lou Harris, Vince Gill, Mark O'Connor, Doug Dillard, Rod Stewart, Ann Murray, Earl Scruggs, and the Eagles, to his spiraling success as a musician, husband and father. Byron Berline, A Fiddler's Diary, is a peek inside the music industry as only an "A" list insider could explicitly describe. For baby-boomers, it is a dance down memory lane, with all the music and recording artists we love. His story is abundantly entertaining with enough documentation to be considered a reference work. 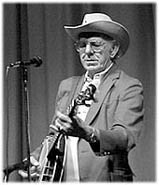 Byron continues to tour, run his Doublestop Fiddle Shop and produces about twenty shows a year at his Music Hall in Guthrie, Oklahoma, as well as being the founder of the annual Oklahoma International Bluegrass Festival and Guthrie's annual Western Swing Festival. Byron continues to perform, record and write, with the same intensity and enthusiasm he has always maintained. He remains... "one of the most inventive fiddle players." 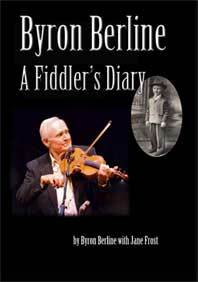 In February, 2013, Grammy nominated, Byron Berline, received his highest recognition to date, being inducted into the National Fiddler's Hall of Fame. In genuine humble response, he invites everyone to, "Stop by the fiddle shop and say, HI"
Country superstar Alan Jackson recorded the Dillards song "There is a time" written by Rodney Dillard & Mitch Jayne on his CD "The Bluegrass Album" released 2013. Click here for the official Rodney Dillard web-page. It has the only store where he autographs things that he sells. It also has info on all the current show packages he offers. For bookings send mail to: booking@rodneydillard.tv. The Dillards were back in the studio to record a new CD. Jeff Gilkinson, a member of the Dillards in the mid 70s, is back with the band. The Dillards now are: Rodney Dillard, Jeff Gilkinson, Beverly Dillard, George Giddens and Ken Lingad. Guests on the new CD: Don Henley and Bernie Leadon from the Eagles, Ricky Skaggs and The Whites, Sam Bush and ex-Dillard Herb Pedersen! The album was written and recorded to be a bookend to the historic "Wheatstraw Suite"�album. The Dillards have a new official webpage: http://officialdillards.com.